When we’ve pulled into the Kynuna (Qld) Roadhouse the two very funny ladies who run it have warned us not to feed the brolgas and no sooner had we parked the van than a brolga wandered over and took ownership of us. We were warned “When you leave the toilet close the door the brolgas poop in there and then people complain when they step in it. They don’t like brolga poop between their toes.” Thus I’m now eating lunch while a big grey brolga peers through the window at me, I daren’t eat outside or else I’ll lose my sandwich. In the evening Woody cooks a few snag on the BBQ and I buy some hot chips from the girls in the roadhouse. I return to find that Woody has been bailed up by the brolgas who also fancy snags for tea. Overly friendly locals … sometimes we don’t need them. I wouldn’t want to mess with one either. Ha ha, we saw those same Brolgas when we passed through there a few weeks ago. 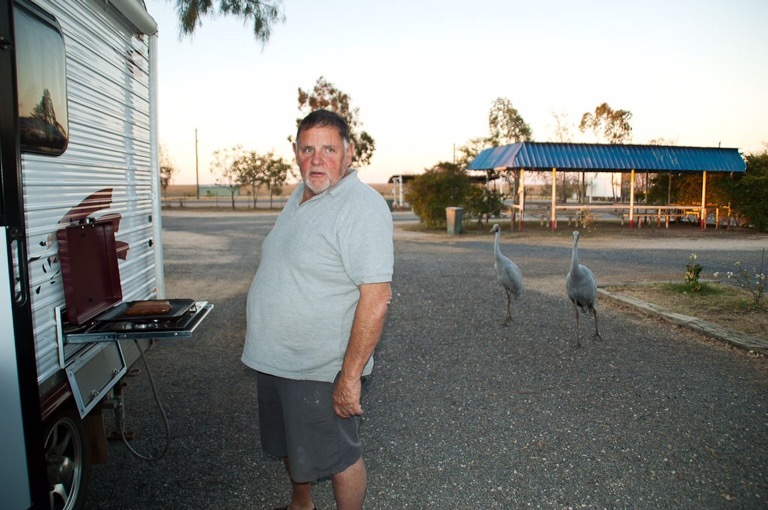 The caravan park at Longreach was full of them at happy hour, visiting every camp looking for offerings!